But as much as Mr. Marley advocates knowing your history, he — along with most other, non-rastafarian historians — seems to have omitted one major part of the Buffalo Soldier story. …Cause we’re going to catch you up on the real story of a Buffalo Soldier. 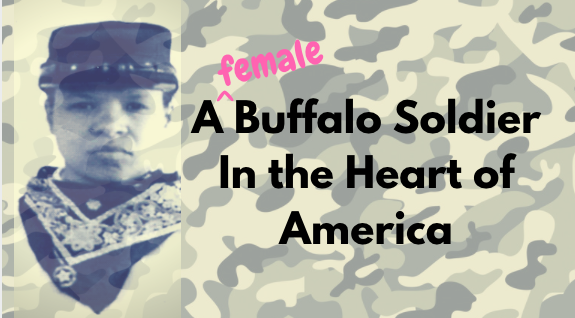 The first and only female Buffalo Soldier, who served in the Union Army and then in the U.S. Army, did so while pretending to be a man. This brave lady, Cathay Williams, offered her life in service to the United States even though she was born a slave. And her story ends in mystery and injustice. Williams was born in Independence, Missouri, in 1844, to an enslaved mother and free father. Aside from the cruel irony of the town’s name, and the fact that it was less than 15 miles from what would become free Kansas, this meant she was born in a state where slavery was legal, making her also a slave (based on her mother’s status). She worked on a plantation, but as the Civil War began, the Union Army invaded Missouri. Williams, a teenager, was taken by the army as “contraband,” and forced to join the Union cause. She traveled with the Union’s 8th Indiana Regiment, most likely working in the capacity of a nurse or a cook. She was moved around to several different posts, without getting a say in her fate, of course, and when the war ended she found herself just south of St. Louis, where she enlisted in the regular U.S. Army. Women were not allowed in the army, but Williams switched her first and last name – going by William Cathay – and dressed as a man, telling only two trusted friends about her plan. She served, she said, because “I wanted to make my own living and not be dependent on relations or friends.” At 22 years old, she began her service in 1866 as part of the Thirty-Eighth U.S. Infantry, one of six all-black regiments in the Army. There was some precedent for this, although Williams would not likely have known about it. During the Revolutionary War, Anna Maria Lane served under George Washington while pretending to be a man. Mary Hays Ludwig was bringing water to soldiers at the Battle of Monmouth when her husband collapsed in battle, causing Ludwig to jump into action and start firing his cannon. In Georgia, Nancy Morgan Hart disguised herself as a crazy man in order to eavesdrop on conversations at British camps. In Massachusetts, Deborah Sampson had disguised herself as a man to fight against the British – and removed a musket ball from her own leg in order to avoid being found out by a doctor. Many of these women, like other soldiers, suffered health effects from battle and Williams was no exception. She worked garrison duty and as a cook through many of the Indian wars in the 1860s. Williams’ health problems escalated during her service, partly due to contracting smallpox and probably also due to the fact that she wasn’t too keen to see a doctor, lest her secret be revealed. Eventually, she was discovered by a military surgeon and discharged from the Army – and her male colleagues were none too nice about it. After being discharged, Williams ended up working as a cook and then a seamstress. She got married to a guy who stole her watch and her horses, who she described as a man of “no account” (the 1868 equivalent of a “Scrub”) and had him arrested. Still battling health problems, she was hospitalized for a while, and applied for a disability pension based on her military service. But when the doctor from the Pension Bureau came to examine her in 1891, he did not qualify her for any disability payments — though she had lost all of her toes to diabetes, walked with a crutch and suffered from nerve pain. In comparison, the white, free-born women mentioned above who served in the Revolutionary War received pensions for their military service, and disability pay for injuries they sustained from the war. Her burial site is unknown, since it would have been a simple grave with a wooden marker that did not hold up to elements over time. All we have today is a bronze bust in Leavenworth, Kansas, erected in 2016 after 20 years of trying to convince donors and city officials that yes, the historic record shows a female Buffalo Soldier did exist. There’s something problematic when a society places greater value on those who fight, or kill, than those who build communities, raise families or take care of the poor. Like W.E.B. DuBois wrote in 1935, about the status of black Civil War soldiers: “The slave pleaded; he was humble; he protected the women of the South, and the world ignored him. The slave killed white men, and behold, he was a man!” But the story of Cathay Williams— who was a Buffalo Soldier, in the heart of America— reveals that for many, not even military service could earn the protection and pride of a country dutifully served.